NAMM 2017: Baritones have been sneaking back into popular guitar consciousness over the past few years, and in the acoustic guitar realm, Cort reckons it's developed the easiest-to-play baritone yet, the NDX Baritone. 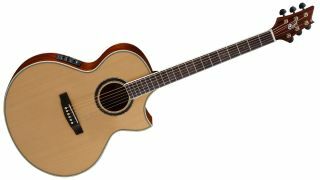 Cort's latest electro-acoustic boasts an elongated 27" scale length, which promises to make it easier to play and stay in tune with a traditional baritone tuning (B E A D F# B). It's "a unique playing experience", apparently. Like the company's other NDX models, the baritone features a Florentine cutaway for enhanced upper-fret access, as well as a deep body shape (up to 125mm) and scallop x-bracing for improved resonance. Elsewhere, the guitar packs a solid Sitka spruce top, mahogany back and sides, rosewood fingerboard, Grover tuners and Fishman Presys Blend EQ with Sonicore pickup, which includes a microphone for blending with the under-saddle pickup. The NDX Baritone is available soon for $699.99.